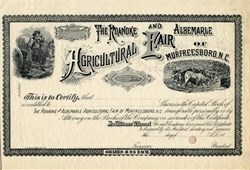 Beautiful unissued / specimen certificate from the Roanoke and Albemarle Agriculturale Fair predated for the 1800's. This historic document was printed by the W.B. Spencer Company and has an ornate border around it with a vignettes of cattle.